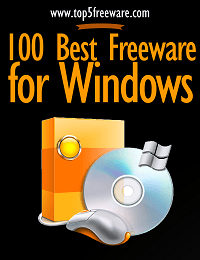 There are total of 100 freeware listed in this eBook along with a brief description, download link, and review link about that freeware. This free eBook contains the following 8 sections with total of 51 pages. Audio and Video Software – This contains audio/video recorders, editors, players, converters, etc. Image Editor and Viewer – This section has several high quality free image viewers, editors, converters, etc. Security Software – Several commercial grade free firewalls, anti-virus software, spyware removers, etc. Backup and Disk Utilities – Backup utilities, disk defragmenter, disk space analyzer, etc. System Utilities – This section has several extremely helpful system utilities like registry cleaners, system cleaners, system crash analyzers, etc. Internet – Instant messengers, browser related utilities, etc.